Over at the Nokia Conversations blog, Nokia has properly introduced the Camera Extras application with a video and quick description of each feature. Camera Extras is already available on the Windows Phone marketplace for Nokia Lumia Windows Phones, we have the download link at the end of this post. Below you will find the feature descriptions from the Nokia blog post, and the video released. The video alone should convince you to download Camera Extras, no excuses, if you have a Lumia Windows Phone. Camera Extras downloads as a separate application on the Windows Phone marketplace, but it actually integrates into the Windows Phone OS Camera application. The four features introduced with Camera Extras are Smart Group Shot, Action Shot, Self-Timer, and Panorama. Camera Extras is to be rolled out globally by the end of July. The download is already available right now in the U.S. and China Windows Phone marketplace. Capturing the perfect group picture can be tricky to pull off. Inevitably, at the instant when everyone else in the photo is showing off their best smiles, there will be one person blinking or looking away. With some supreme technological brilliance, Smart Group shot eliminates the need for constant re-takes and lets you capture great pictures of your friends with a single shot. Watch the video above to get a really good demonstration of Smart Group shot in action. Looks like magic, right? Here’s how it works. Your Lumia Camera takes five images in quick succession with a single press of the button. Advanced algorithms are then used to automatically select the ‘best face’ for each person in the photo. Those ‘faces’ are then combined into the final photo. 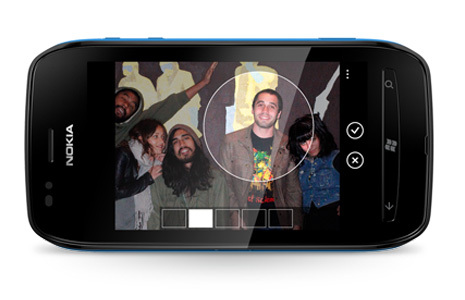 You can also override the camera’s choices and select an alternative face for each person in the image. This could be used, for example, if you wanted an arty image of everyone looking at each other, or everyone looking off into the distance. Smart Group shot promises to be both extremely practical and also a really fun, creative tool for you to play with. Capturing a fantastic photograph that manages to convey movement and pace, such as a racing car or a sprinter, is a good illustration of a still image’s potential power. Traditionally such photos have been the preserve of the professional photographer with their huge (and expensive) camera and lenses. Now though, Action Shot on your Lumia makes such brilliant photos much easier and more accessible for everyone. This mode will allow you to capture action and movement with much faster shooting speeds or as a burst of shots. However, taking the photos is only half the fun. A new control mechanism makes it possible for you to review each photo, one on top of the other. As you slide your finger back and forth you can watch the sequence unfurl on your screen once again, as if you’re controlling the action. Watching through the sequences makes it much easier to pick your best shots. Taking pictures of your friends is great fun, but there is one drawback: You’re never in the picture with them! Self-timer is an easy and effective way of putting yourself in the picture. Prop up your Lumia securely, press the button and then get yourself in the frame before the countdown ends. This feature is another really good demonstration of how your Lumia smartphone camera is replacing the need for a standalone compact camera. Our eyes have a remarkably wide field of vision, so it is frustrating when our cameras are unable to replicate the stunning landscapes that we see before us. Panorama, however, lets you do just that. The new user interface makes it simpler than ever before to capture beautiful wide landscape photos. As you move your Lumia camera across the scene that you are photographing, the screen guides you along for precise alignment. The finished panoramas will appear so seamless and smooth that it will appear as if you’d taken one stunning image! I can’t see any reason why it wasn’t just released globally. So I have to wait till end of July for this one then, thanks Nokia.